Come join us as we discuss the state of Black Science Fiction, share our stories and perform a group reading created especially for this event. Participating in this first of its kind event are Ed Hall, L.M. Davis, Milton Davis, Alan Jones, Alicia McCalla, Wendy Raven McNair and Balogun Ojetade. 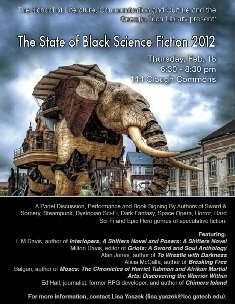 The State of Black Sci-Fi 2012: Why is it Important to Show Race, Culture, Minority Politics or Ethnicity in Sci-Fi?